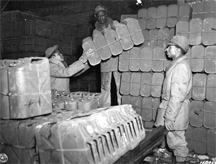 Red Ball Express troops stack "jerry cans" used to transport gasoline to front-line units during World War II. "Red Ball Express" was the name given to an operation of the U.S. Army Quartermaster Corps, responsible for movement of men and materiel in the months following the breakout from the Normandy beachhead in World War II. To disrupt enemy logistics, the Allies had destroyed the French rail system from the air before the Normandy landings. After the landings, the Allies then had to rely on truck transport for their own logistics needs. At its peak, the Red Ball Express was running 5,938 vehicles carrying 12,342 tons each day. At the time, and to some extent, today as well, supplying combat troops was one military activity held in lower regard than combat operations. Consistent with this differential regard, and with the racial attitudes of the day, most of the Red Ball Express truck drivers were African-American. This system provides a dramatic example of inappropriate levels of regard. In constructing his strategy for the Ardennes offensive in December of 1944, Hitler calculated that Eisenhower would be unable to respond quickly enough to prevent German armor from reaching the port at Antwerp. But Hitler did not realize that the trucks engaged in ongoing logistics support could be so quickly re-oriented to respond to his offensive. On December 17, for example, one day after the German offensive began, 11,000 trucks moved 60,000 men, their ammunition and supplies, into the Ardennes. In the first week of the battle, the Allies moved 250,000 men and 50,000 vehicles. The trucks and their drivers made a critical contribution, preventing what would otherwise have likely been a military catastrophe for the Allies. Photo courtesy U.S. Army Transportation Museum. A few years ago I broke a bone in my right foot: metatarsal #5. Never mind how. Metatarsals are the longish bones that connect the ankle-and-heel assembly to the toes. Metatarsal #5 connects your pinky toe to your ankle. Not a bad break, but enough to require one of those walking boot casts and a cane for about six weeks. Let me tell you, the foot is a very undervalued body part. Functioning without full use of a foot presents all kinds of challenges you wouldn't normally think about. As a cure for not paying attention to something important, few things are as instructive as losing use of a foot, even for only six weeks. I now totally respect both feet. They're experts at what they do, and they're good at it. Organizations also have parts — we call them subsidiaries, divisions, departments, groups, and teams, and probably there are many more names. The people of most organizations value the parts of those organizations differently. Some parts are prized and held in high regard; some are less prized and are held in lesser regard. Some are rarely thought of at all, which can happen even when they are essential to high organizational performance. Just like my foot and me, we realize how important the less-valued parts of the organization are only when they somehow become unavailable. See if you can estimate how long you would be able to do what you do at work after the phone system stops working, or after they stop emptying the dumpsters. When we evaluate someone's importance or the importance of their contributions, most of us allow ourselves to be biased by the level of regard we have for the part of the organization to which they belong. If we have a low regard for janitorial services, some of us tend to have a lower regard than we otherwise would for the people who provide those services. If we have a low regard for product testing, some of us tend to have a lower regard than we otherwise would for those who do the testing. most of us allow ourselves to be biasedwhether or not the plans they develop are any good. If we have a high regard for a consulting firm, we tend to have a higher regard than we otherwise would for the people who work for that firm, no matter what they are advising us to do. Would you like to see your comments posted here? rbrenonbAlGbxsabPPakuner@ChaccxIaqscKoNmVuhhUoCanyon.comSend me your comments by email, or by Web form. I offer email and telephone coaching at both corporate and individual rates. Contact Rick for details at rbrenkyUzOpRSBcEerXCOner@ChacWZoQQcKThHaejQKuoCanyon.com or (650) 787-6475, or toll-free in the continental US at (866) 378-5470.